Comfort food seems to be mostly associated with the cold and dreary days of Winter, but I think it’s something to be enjoyed throughout the entire year. Rainy Summer days are open invitations for comfort food as well in my opinion. My favorite part about this dish is the added health benefits! You don’t always get lucky enough to combine comfort food and health benefits in the same meal. My second favorite part is the lack of dishes to hand wash after dinner! I love finding one pot or one skillet dinners where the majority of your time isn’t spent prepping and cleaning up, but instead enjoying the scrumptious food! This also makes it a great weeknight option and with the busy life we all live these days you can never have too many of those in your recipe box! I will be honest and tell you sweet potatoes are just not a favorite of mine. I try to incorporate them into meals simply because they provide an array of health benefits. Mostly, sweet potatoes are full of calcium, potassium, vitamin A and vitamin C. With this new recipe though, I can say I will eat them for taste and nutrition! The combination of flavor works really well and I can see this meal being added to our regular dinner rotation…even on sunny days 🙂 Please save the recipe below and give it a try! If you aren’t a big fan of sweet potatoes either make this their last chance to prove themselves to you and you just might keep them around in your pantry! Enjoy! In a large oven-proof skillet, heat olive oil over medium heat. Add ground turkey and garlic and cook for about 10 minutes, stirring occasionally. Add onions and yellow pepper and season with salt and pepper. Cook until onions begin to brown. 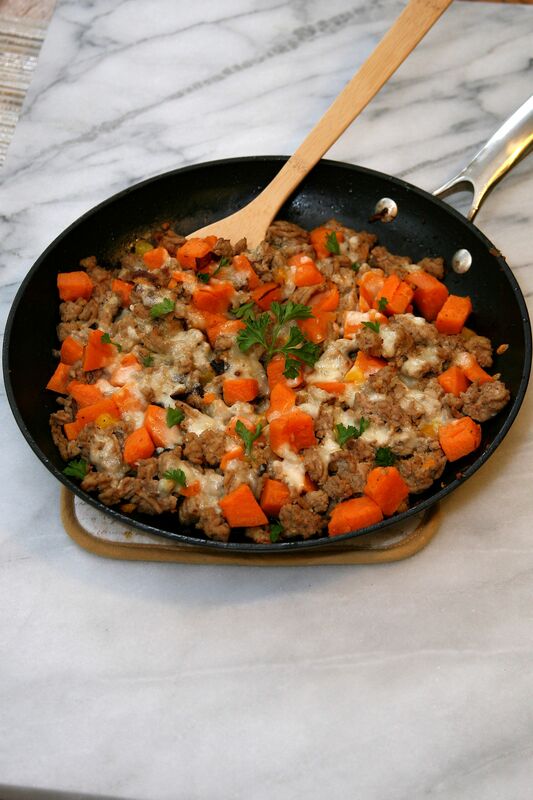 Add the sweet potato, cover the skillet and cook until tender, stirring occasionally. If needed, add extra olive oil or water at this point to help cook the potatoes. Once the potatoes are tender, top with mozzarella cheese and place the skillet in the heated oven. Bake until the cheese has melted and potatoes are fully cooked. Remove from oven, garnish with parsley and serve immediately.